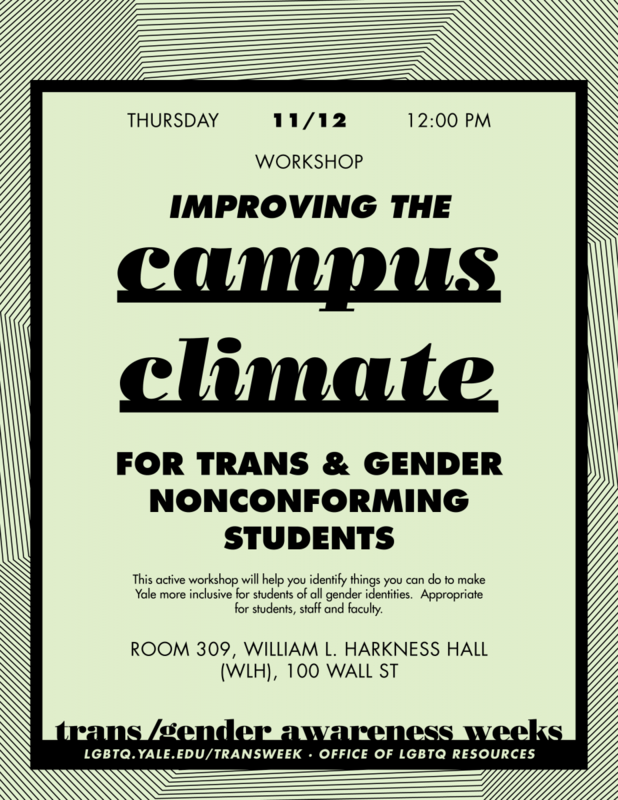 Originally founded to create space on campus for exploring issues related to gender identity, Trans*/gender Awareness Week at Yale has expanded into an annual series of events celebrating and exploring a variety of trans and gender non-conforming identities, experiences, and communities. 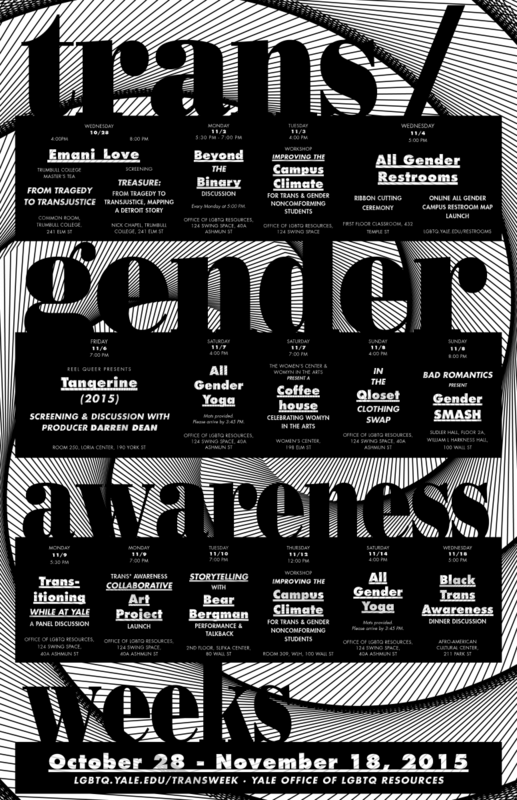 Whether you’ve never heard the word “trans*” before or whether you’ve been deeply involved in the LGBTQ community for years, whether you’re interested in the intersection of race and gender or whether you just want to enjoy a great performance, Trans*/gender Awareness Week has something for everyone. Have you been wondering what Beyond the Binary is? 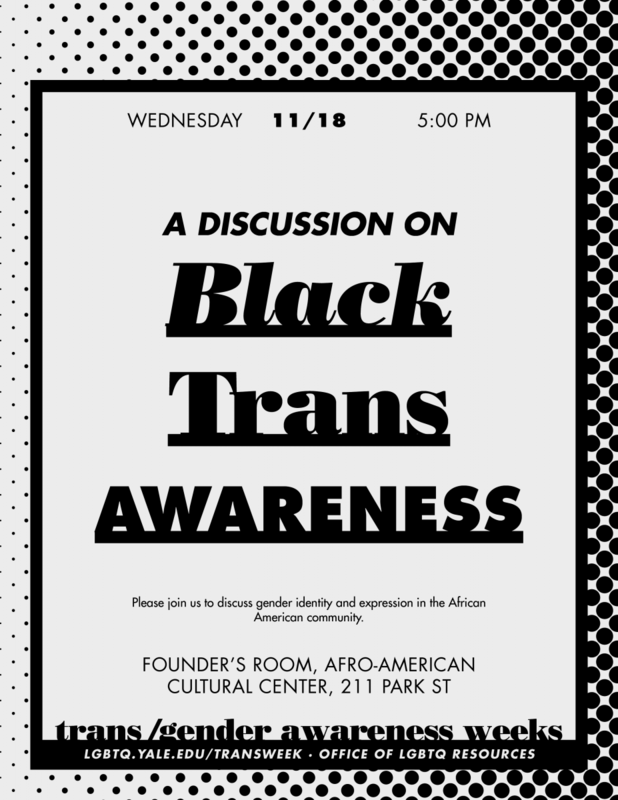 Join Seth Wallace and Kacei Conyers for our ongoing discussion on gender identity. 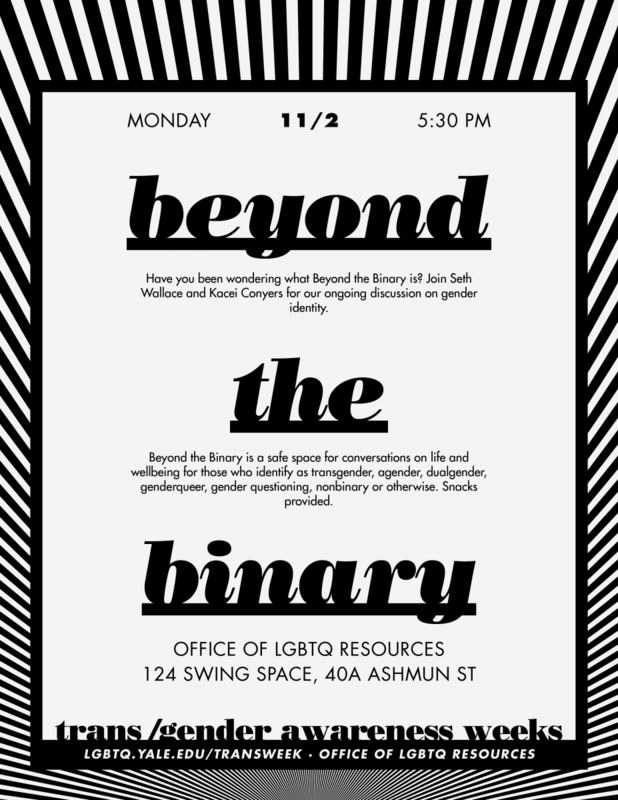 Beyond the Binary is a safe space for conversations on life and wellbeing for those who identify as transgender, agender, dualgender, genderqueer, gender questioning, nonbinary or otherwise. Snacks provided. This active workshop will help you identify things you can do to make Yale more inclusive for students of all gender identities. Appropriate for students, staff and faculty. 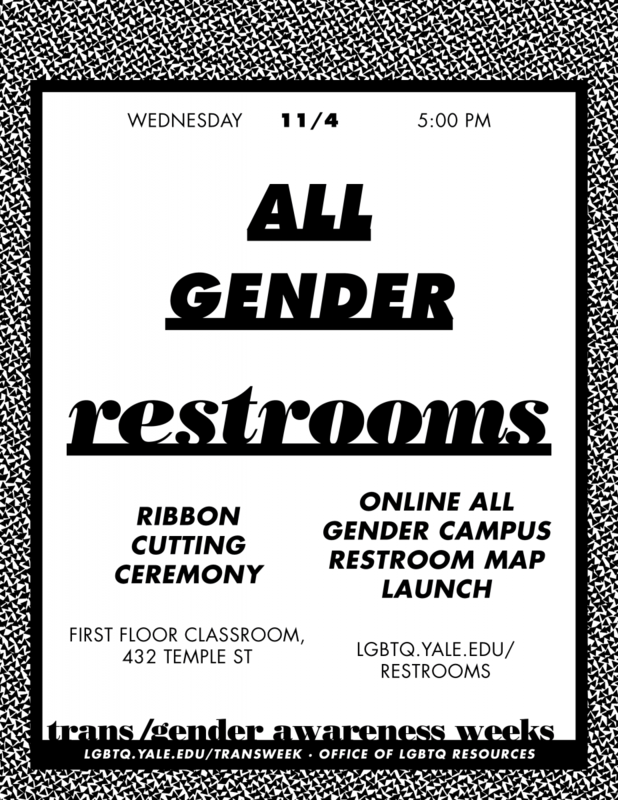 Come celebrate the opening of new all gender restrooms across campus and the launch of the All Gender Restroom Map with Dean of Faculty of Arts and Sciences Tamar Gendler! 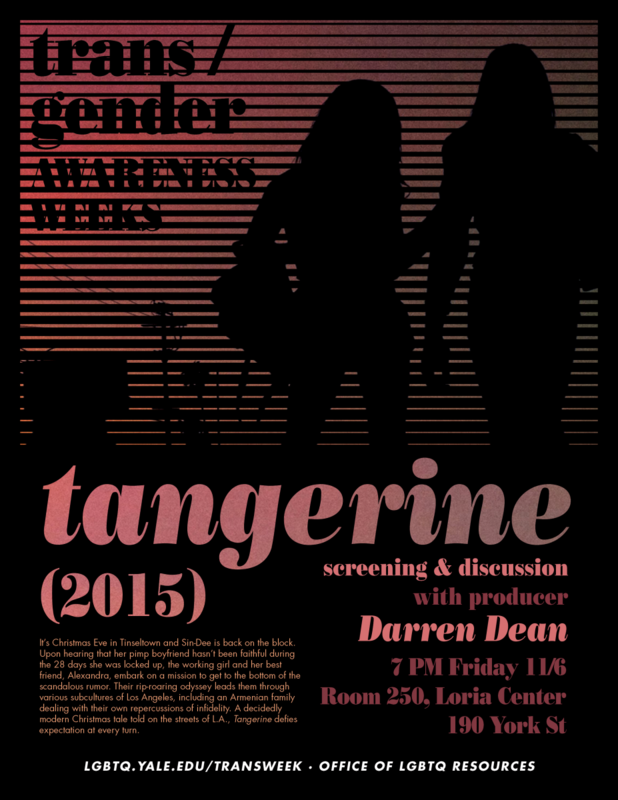 Join Tangerine producer Darren Dean for a special ultra high definition screening and discussion of the Sundance Official Selection and NY Times Critic's Pick. Enjoy a bendy, fun, relaxing and body-affirming hour of yoga! 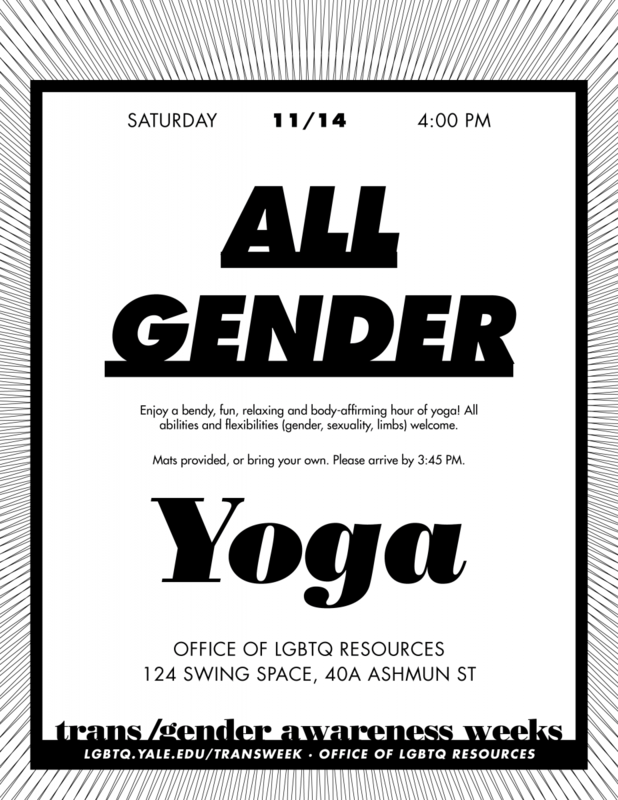 All abilities and flexibilities (gender, sexuality, limbs) welcome. Mats provided, or bring your own. Please arrive by 3:45 PM. 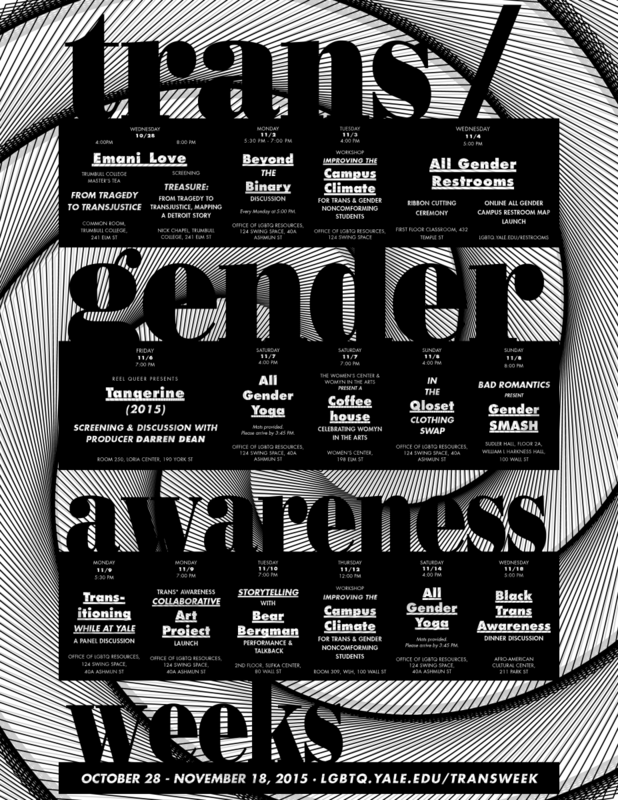 Do you identify as trans, non-binary, agender, or outside of the gender binary? 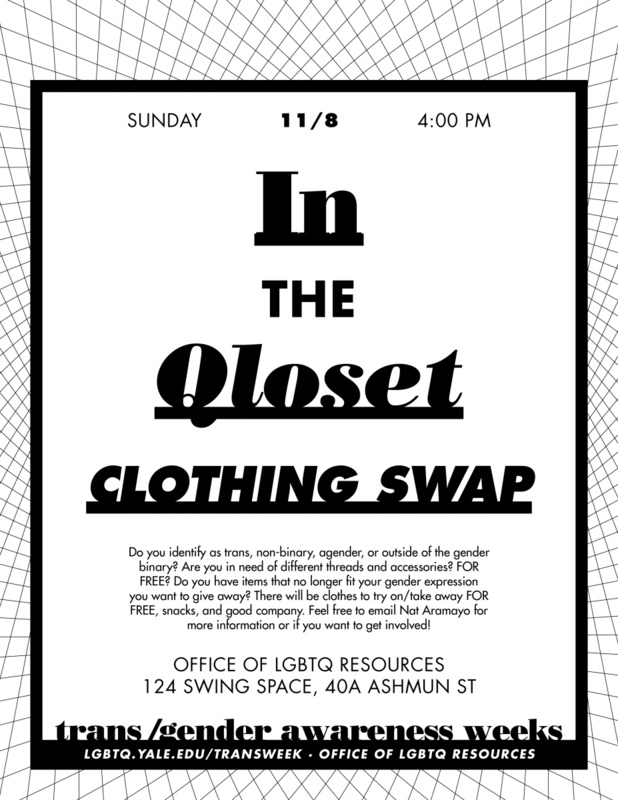 Get new threads and accessories for free and/or bring items that no longer fit your gender expression at the In the Qloset Clothing Swap! Yale's only drag, burlesque, and cabaret troupe is dusting off its high heels and bow ties for the first show of the year. 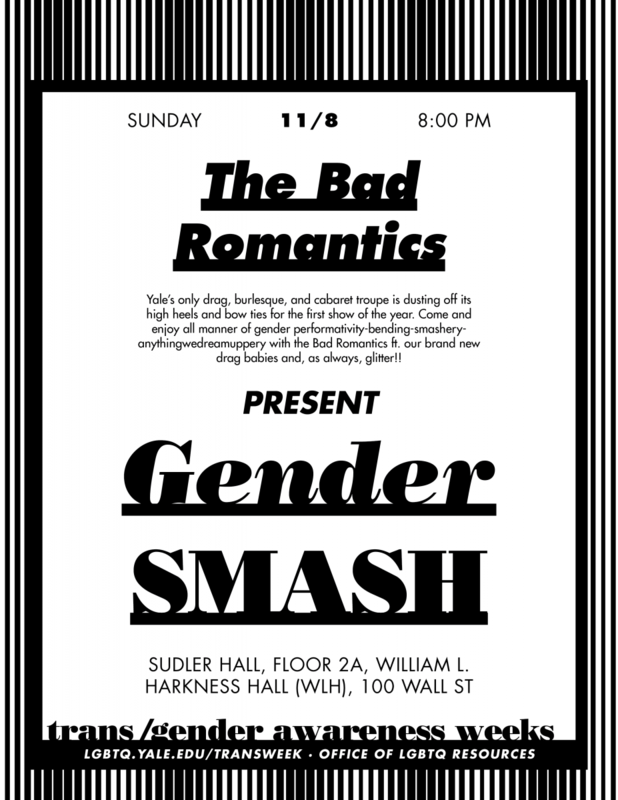 Come and enjoy all manner of gender performativity-bending-smashery-anythingwedreamuppery with the Bad Romantics ft. our brand new drag babies and, as always, glitter!! 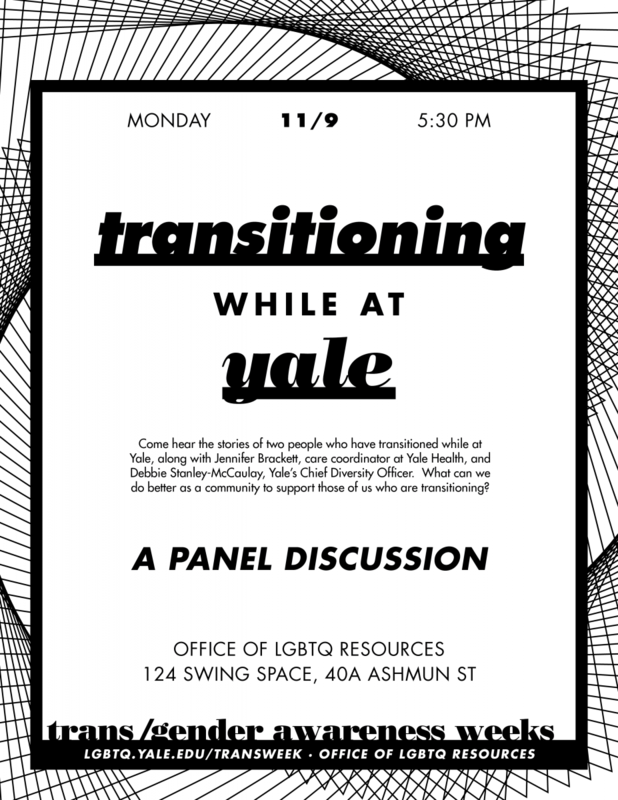 Come hear the stories of two people who have transitioned while at Yale, along with Jennifer Brackett, care coordinator at Yale Health, and Debbie Stanley-McCaulay, Yale’s Chief Diversity Officer. What can we do better as a community to support those of us who are transitioning? 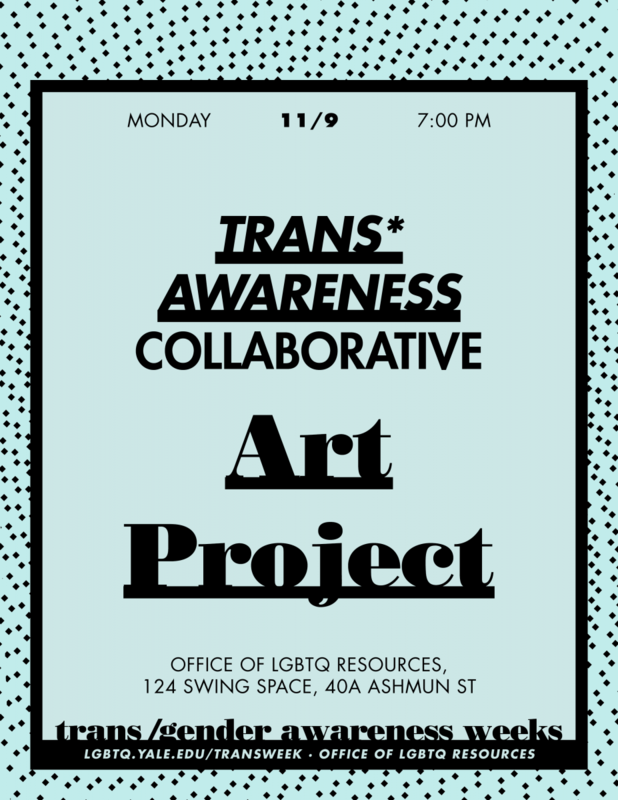 Come find out more about the Trans* Awareness Collaborative Art Project! 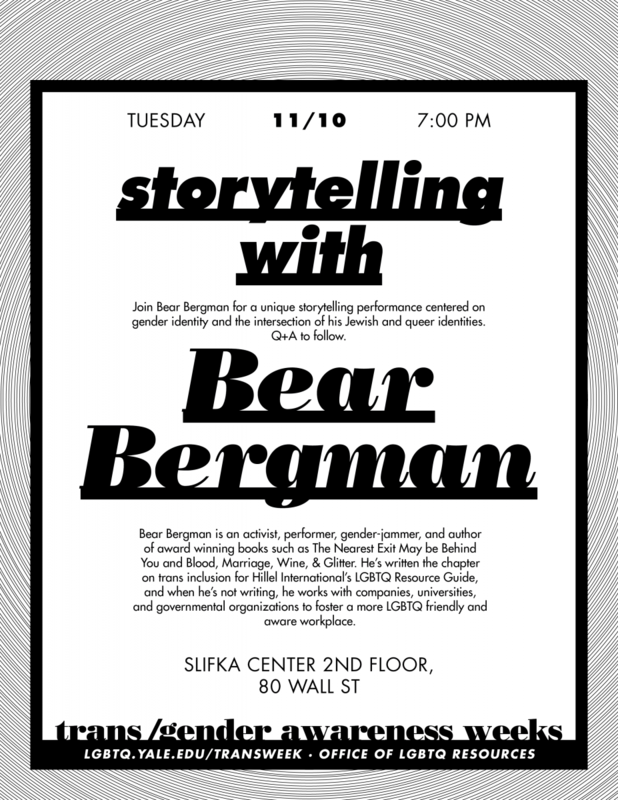 Join activist, performer, gender-jammer, and award-winning author Bear Bergman for a unique storytelling performance centered on gender identity and the intersection of his Jewish and queer identities. Q+A to follow. 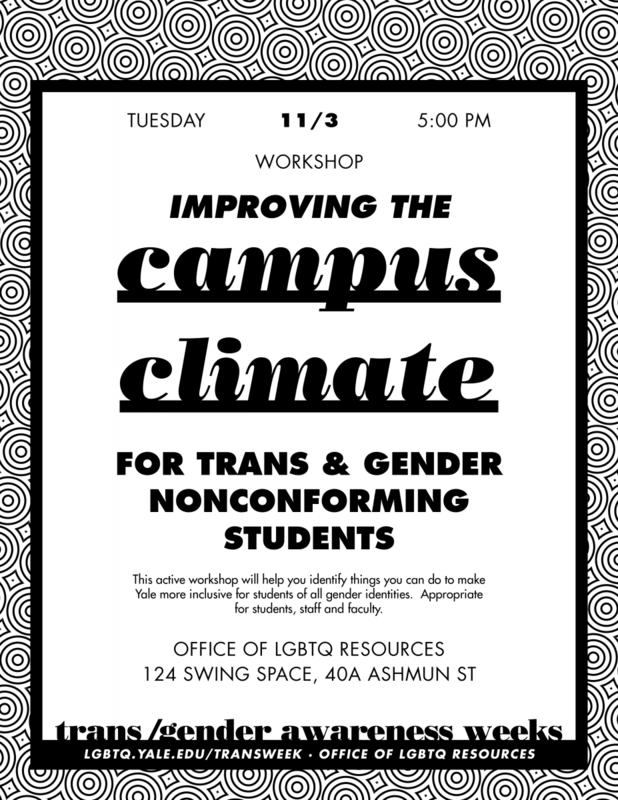 Co-sponsored by the Slifka Center and LGBT Studies. Join a discussion on gender identity and expression in the African American community.